I don't know why but I always find it harder to think of gift ideas for the men in my life. I never want to be obvious and get them a pair of socks or a few bottles of beer with a gift card. I'm a huge fan of Police fragrances. From their quirky bottles to the actual scents. They are super affordable, I always go for a gift set, they have more of a Wow factor also it's always nice to layer your scent with either a shower gel or moisturiser as it lasts longer. Watches have come a long way from just telling the time. A watch can make an outfit, from everyday wear to Black Tie do's definitely a sleek-looking Rolex, but lets keep it real Rolex's, they aren't cheap!!. Luckily there are websites like Xupes around, who sell second-hand Rolex. Vintage is so in at the moment, so who wouldn't want to open a pre owned Rolex this Christmas? If I had to pick a woolly item, it would always be a beanie. Yes they are practical, but also stylist and more appreciated over other items like a scarf or socks. For the foodie in your life you can't beat an espresso pot for that coffee addict in your life. This chilli pack from Scarlet & Mustard is perfect for the man who loves a bit of heat in his food, also they have retro flavours for sharing for those that like your schoolday memoriesyou have to try their lemon curd it's amazing. And for the big kid in your life, you have to get them a Nerf gun. I didn't realise how much of a big deal Nerf guns were until I came across a Youtube video. These toy guns are most definitely not for for little kids under the age of 21!!!. 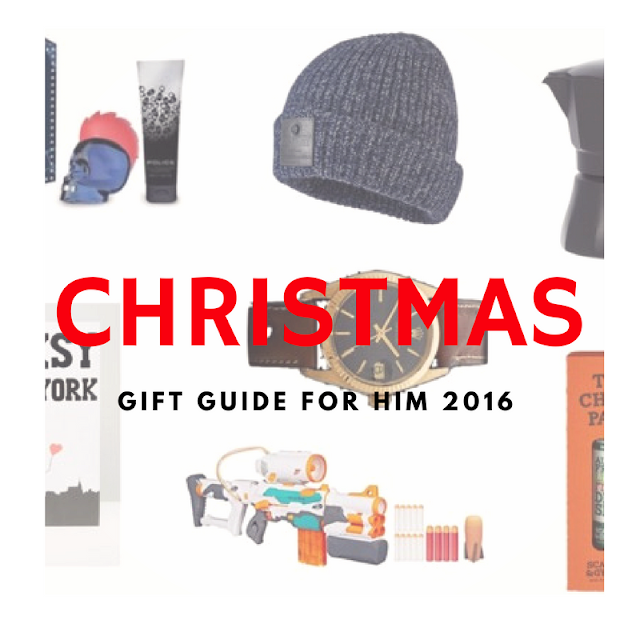 I hope you found my Christmas gift guide for him helpful. If you were stuck and desperately seeking some inspiration as part of te Christmas gift countdown have a look and see wat you can find, you never know you might also find a little someting for yourself!!! !.